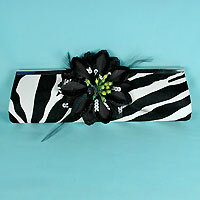 Zebra print clutch bag with large flower on decoration. This is a bold design with black and white zebra stripes and a large black flower on one side. This evening bag is slim and long with a metal frame and clasp. It is completely lined and has a metal shoulder chain. This is a small purse but has great style. It would look terrific with that little black dress. Color: black white. Hue: black and white. color code: #G00006. 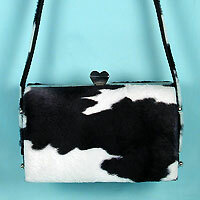 Measurements: width 10-3/8", height 3", depth 2-1/4"
Small cow print bag with metal frame. Includes matching cow print removable handle with 8-1/2 inch drop. 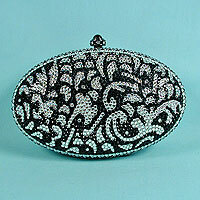 Measurements: width 6", height 3½", depth 3"
Elegant crystal rhinestone evening bag clutch. This evening bag is fashioned with small round black and clear crystal rhinestones in a random swirled design. It has a wide row of checkerboard rhinestone around the perimeter. The body is metal and it has a push clasp. It is lined in silver leather with a pewter shoulder chain. A faux leather pouch is included for storage. It&squot;s a beautiful evening purse that is perfect for that little black dress but will also look sensational with red blue and any solid colored dress. Measurements: width 6", height 3-13/4", depth 2-1/4"